First, it will be easier to lay out your app if you imagine the starting position of the user as (X: 0, Y: 0, Z: 0). Since the Main Camera is tracking movement of the user's head, the starting position of the user can be set by setting the starting position of the Main Camera. For HoloLens applications, the real world should appear behind everything the camera renders, not a Skybox texture. With the Main Camera still selected in the Hierarchy panel, find the Camera component in the Inspector panel and change the Clear Flags dropdown from Skybox to Solid Color. For mixed reality applications targeted to immersive headsets, we can use the default Skybox texture that Unity provides. 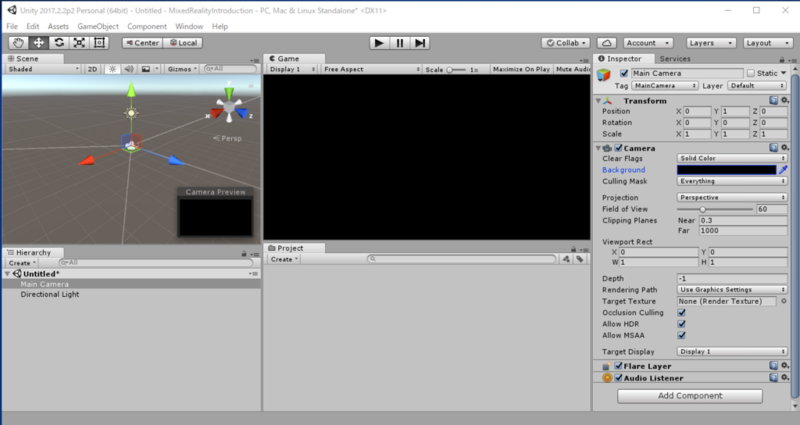 With the Main Camera still selected in the Hierarchy panel, find the Camera component in the Inspector panel and keep the Clear Flags dropdown to Skybox.